Punch is made up of water, sugar, alcohol, spice and oleo-saccharum. The last ingredient might sound like the scientific name for a pelvic bone, but it’s actually a mix of citrus oil and sugar. And it’s a non-negotiable component of good punch. By its classical definition, a punch is made up of five components: water, citrus, alcohol, spice and oleo-saccharum. The last ingredient might sound like the scientific name for a pelvic bone, but it’s actually a mix of citrus oil and sugar. And it’s a non-negotiable component of good punch, top bartenders say. 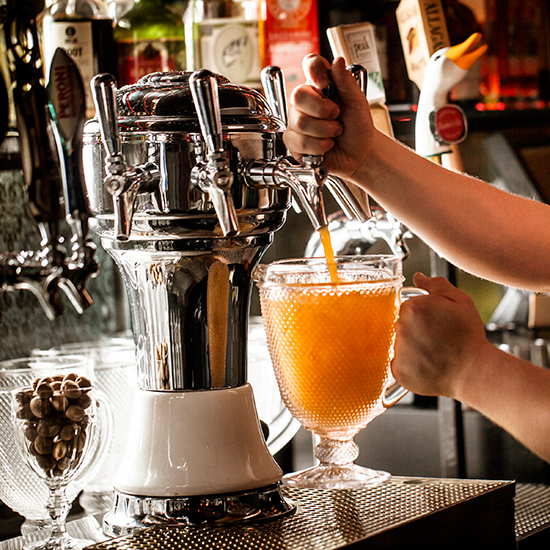 “If there’s no oleo-saccharum, it’s not a punch,” says Dillon Lockwood, bartender at San Francisco’s punch-centric Novela. “It’s like calling something a martini just because it’s served in a martini glass." To make oleo-saccharum, simply peel oranges or lemons (never limes, their skin is too bitter), muddle the peels with sugar and let the mix sit until the oil emerges from the skins—about half an hour. Strain, and you have the base for the best punch ever. Mixed with citrus juice like orange, lime or lemon, oleo-saccharum transforms into a concentrated sour mix that you can keep in your fridge for over a week. Simply add water, alcohol, spice and sugar and you have instant punch—something that Lockwood is looking to market with Novela. They are creating punch mixes by the bottle—oleo-saccharum included. “All you need to do is add booze and water,” he says. Until Novela releases its insta-punch, you can make your own oleo-saccharum at home. Here, a basic recipe for a concentrated sour mix that will make enough for a liter of punch. Muddle the peels with the sugar, then let sit for 30 minutes. Mix with the lemon juice, then strain off the peels. Use immediately in punch—like the one below from Lockwood—or refrigerate. Blend pumpkin and persimmon with the rum. Then combine with the rest of the ingredients. Strain out the solids, stir and serve, chilled.